Posting photos of students on website. How to practice or perform to the song, "Tai Chi Magic," by Buddha Zhen. Biggest audience of all Shaolin Records PODCASTS. Each episode is another chapter of the "Basics of Shaolin Zen." Graduation Ceremonies held on first Saturday of February. 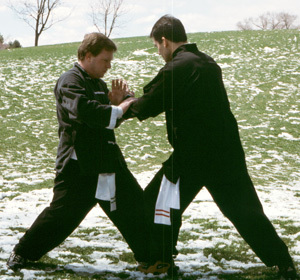 New Home Page of Buddha Kung Fu has links to webpages regarding Body/Mind/Spirit. 5. One Notebook for Two Books? It's a science, not a religion. Inform the Demo Team Captain if you'd like to participate. Get all your Belt Test Approvals as you go. If there isn't enough class time at the end of the semester you'll have to book private lessons, or wait another 7 months until November BKF Annual Meeting. Should we always have these "Body / Mind / Spirit" LINKS on our homepage? Buddha Zhen performed "Bunbo" at Founder's Day event. Even if books are printed for class--the book was designed with links to internet. Works for slow Tai Chi form. Are students really listening to them? Be prepared to perform your Yang Tai Chi Form of Shaolin Chi Mantis. 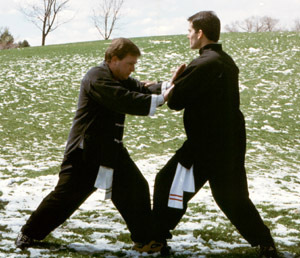 BKF Homepage has photos of Disciples Barry and Paul. 3. Kung Fu or Tai Chi? shaolinInteractive.com is divided into two courses. Working out well for students. 6.Practice Tai Chi Form to "Night Blue Sky" song. 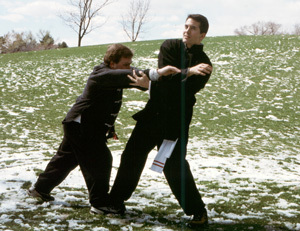 The Tai Chi Form of SCM is 54 breaths. April 8 is when we celebrate Buddha's birthday. Should we perform the Tai Chi Form slow at graduation? 7. Buddha Kung Fu Shirts Required? How can we spend our time becoming better Buddhists? 9. May Begins "Lian Bu" = "Masonic Kung Fu"
Pay attention to the advanced students demonstrating techniques for their belt testing. 2.Should the BKF Homepage Change Monthly? Sign up now to perform with out BKF Demo Team. Get one to practice new show. 7. No More BKF Uniforms? We're going to Chinatown and buying our uniforms there. Want to know Buddha Z? 4. Next Demo Team Performance = Tai Chi Seminars? ...this book by The HIppy Coyote (Buddha Zhen), details his Kung Fu journey since 1980. ... get anyone you know that is interested in Yoga or Tai Chi to attend a seminar. Each weekend is a different seminar topic. Couldn't find book MASTER on recent trip to storage unit. The ever-changing items of our CafePress.com stores. Buddha Kung Fu promotes seminars more than tournaments for next year. Equestrians contact Buddha Zhen for Horse Chi lesson. Students need for Belt Test advancement. PayPal buttons created for student convenience. First time with the photos. New "light-weight" for Kung Fu workouts. Buddha Kung Fu needs tapestry for altar for Kung Fu and Tai Chi videos. 9. First Students to 3rd Blue Stripe in Buddha Kung Fu? Disciples Shawn and Jessica are ready for the INTERMEDIATE LEVEL of BKF. Too bad it didn't make it into the Olympics. This poetry book represents Richard Del Connor's early concept that life is not measured in years, but in seasons. AUTUMN = LEVEL 1 season. This is my BEST ALBUM ever. Look good for our Tournaments and Annual membership meeting. So you've travelled all the LEVEL 1 webpages of American Zen. These really do summarize the state of the nation. Since 1996, Tai Chi Youth has been the predominant school of Shaolin Chi Mantis. So all the planning committees and Membership Directors were TCY Volunteers and Board Officers. 10. YMCA Senior Classes are Full! When the YMCA Senior Tai Chi Classes were launched by me in 2004, they were full. That was because I had a Tai Chi Beginner class preceeding them. Check out the new ZEN BUDDHIST PODCASTS for the Shaolin Zen lessons on our patron saint. People seem to be working during the above time slots. Bummer, we're cancelling our tournament. We decided that we need at least 6 Push Hands contestants to have a real tournament. And that's one division with all 6 in it. 5. Future of Buddha Kung Fu = Tai Chi Youth? Everyone loves this album. I am very proud of it. Check it out. I want one. Did you travel LEVEL 2 section of www.americanZEN.org? I've been working with the Los Angeles and Glendale SBA, Small Business Administration, to create a business plan for Buddha Kung Fu. We have a couple of students who have volunteered but we need 15 trustees. I've got a new business plan to finance the TCY Online school. I'm an artist. I'm a performer. I love applause. I love attention. 2. Static Page for 2011? 2011 is going to be focused on my relaunching Tai Chi Youth. My plan is to complete the shaolinINTERACTIVE website through Tai Chi Youth. Do we want to create a new show? Being a MIND and body school requires books. Or you can give the more romantic album, LEVEL 3 = I WANT YOU TO LOVE ME by American Zen. Give a license plate for Christmas... HINT: I still don't have one. LEVEL 3 = I Want You To Love Me. The NEW TCY Board of Trustees has been formed and elected Richard Del Connor as TCY PATRIARCH. Visit Tai Chi Youth website for current list of TCY Trustees. I've gone to the Montrose library and checked out a dozen books for nonprofit management.